I haven't posted many dinner ideas lately, so I thought I would share one of our favorites. Winter Chicken Bake is an easy one dish meal that is perfect on a cold winter evening. The flavor combination is delicious! 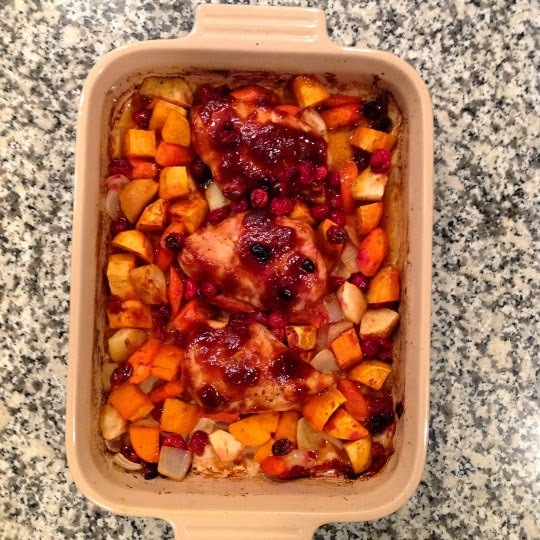 Sweet potatoes, onion, carrots, apples and chicken baked in a cranberry barbecue sauce. I use fresh cranberries, but frozen would be fine too. Not fond of sweet potatoes? Use Russet or little red potatoes. This dish has so many possibilities! I usually serve Winter Chicken Bake with roasted green beans or broccoli. Add it to your dinner rotation and let me know what you think! Spray a 9 x 13 inch bake dish with cooking spray. dish; drizzle with olive oil. Season with salt and pepper. of the vegetables. Sprinkle cranberries over the entire dish. Bake for about 45 minutes or until chicken is tender and no longer pink in the center.